Fright Chasers: Soul Reaper Collector's Edition is rated 3.1 out of 5 by 21. Rated 5 out of 5 by sourkraut from Love it! Another lovingly created game by MadHead. They approach the genre with a slight twist that is missing from so many games. The only downside for me, is that the cut scene animation is a bit weak, but that's not really an issue. In all honesty, the moment I see a game is made by them, I buy it, because I know I won't be disappointed. Rated 5 out of 5 by rainworm from Off to a great adventure - fright is guaranteed! The Fright Chaser girls are back! Reminder from the Case Files: the Fright Chasers Blog was established to document unusual, eerie and scary places, exploring odd and unexplainable occurances and get to the bottom of it. Their first case led them to the Killbourn Observatory, this time we won’t have one place to investigate but a group of people…. Special equpment is again on board: the camera (a ‘special’ tool to see, how events have led to the result and uncover the hiding place of important objects for our investigation). It was invented in the first Fright Chasers case ‘Dark Exposure’. We start out with an anonymous email on the famous Glenville disappearances. The writer believes, those are in fact murders, committed by supernatural means and asks for a meeting at Glenville cemetery. Attached to the mail was a video clip, showing a disguised figure conjuring some kind of spell on one of the vanished people, Wright. On our way to the meeting point, we are pondering on known events at Glenville, among other things a terrible train accident in 1899. At the cemetery: a grave robber. A security man, whose weapon is melted in his hand by the supernaturally powered grip of the grave robber – what to make of that? The grave robber disappears and the security man hands us a valueable clue before leaving the scene: a list of names. One name on the list we find on the epitaph of the ravaged tomb, another one is that of the man in the video clip. So the list seems to contain others, who may be in danger. Our visit to the next on the list varifies our thesis: some monstrous killer is after those men and women. They seem to form a group with a secret and a meeting point, the Enigmatis Club. There we will come close to a solution of this mystery. After a confrontation with the monster we awake – dead. And we meet all people, whose names were on the list. All of them are dead, died in the train crash of 1899 but apparently have found a way to be still alive. A weird and thrilling story, masterly told in good pace. There is not too much to and fro but we arrive at a scene, investigate and follow the next clue. Step by step we learn, what started with the suspicion of murder my means of the supernatural, is more than what it seems. After each location, we are given a summary of facts and conclusions on our ride to the next. Nice new feature, you are always up to date. HOS and puzzles are entertaining, no choice between hard and easy but challenging enough, except for puzzle experts, who may want more. All in all this game is even better, than the first one, for me. Pace is much faster, the story is easy to follow and suspensefully to play. Some remarks are literally black humor as such, so even the language used in the game is fun. Rated 5 out of 5 by sunnyglow from ALL ABOARD! GET ON TRACK FOR AN ADVENTURE THROUGH TIME AND SPACE REVIEW BASED ON THE ENTIRE GAME: 5 Chapters Plus a Bonus Chapter – Strategy Guide: 43 Pages – Time: 5 Hours OVERVIEW/BACKGROUND All aboard! Find yourself on track to play a supernatural thriller! Travel to Glennville where members of the Enigmatist’s Club are being murdered. What is behind these gruesome murders? These events seem tied to an 1899 tragic train crash. Get on board for a game with twists and turns - resurrecting some history which would be better left buried. You will be switching back-and-forth on the tracks of time in a game in which nothing is as it seems. A ghostly supernatural thriller is set to depart. Rev up your motorcycle and get prepared to travel quite a bit in this game. The future of the town of Glennville rests in your hands. OPINION: This is an easy-breezy ghostly whodunit. It should appeal to those who like mysteries, the paranormal, or both. I purchased this game for the story. The story behind the game is excellent with a plot which takes many twists and turns. I love this developer’s games; however, I do wish they would get rid of the gimmicks. 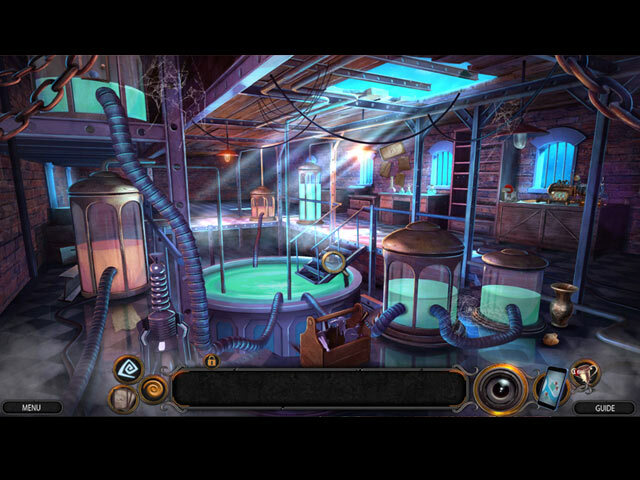 You receive a “special camera” to locate all those spooky supernatural elements within the game. Although it was used excessively in the demo, it was used less in the main game and completely disappeared in the bonus chapter. The pace is excellent with plenty of activities to keep you busy. The graphics are cartoonish as in all the other games within the series. BONUS CHAPTER: It is a sequel. Out of your dreams and into reality comes your next case. Find yourself in a trailer park in which you must save an inventor from eternal torment and catch a hooded person in their quest to use this inventor’s technology for misguided purposes. I found the chapter short. There are eight (8) HOP scenes and seven (7) puzzles within the chapter most of which are akin to those in the main game. MECHANICS: Mad Head provides five (5) levels play which includes customization. There are twelve (12) achievements, some with three parts. Collect thirty (30) swirls, thirty (30) morphing objects, eleven (11) cards and thirty-one (31) treasures. Most are easy to locate and there are some morphing objects within the HOP scenes. You cannot search for the treasures until you have found all the collectibles. However, you can return to the scenes to locate them. As stated previously, you use a camera to search for supernatural elements within the game. After locating the items, you then view a video taking you back in time to view some important aspect to the case at hand. There are eight (8) wallpapers with the usual concept art and music selections. You can replay nineteen (19) HOP scenes. Again, I wish Mad Head would provide a replay of some of the puzzles as well. HOP SCENES: There are thirty-one (31) HOP scenes in the game. This includes four (4) mini-HOP scenes which require searching for five (5) items to create an inventory item. They are scenes which are seen in most games. I found little creativity in the design of the scenes. Most of the HOP scenes are standard lists of items. There are several storybook scenes in which you must locate two of the same type of symbol within each scene. There are some silhouette scenes and a few matching scenes as well. Except for the storybook scenes, most of the scenes seemed to be junk piles of items to locate. There are two scenes which I felt were creatively designed. There is a pattern scene in which you search for items based upon their pattern not their silhouette. 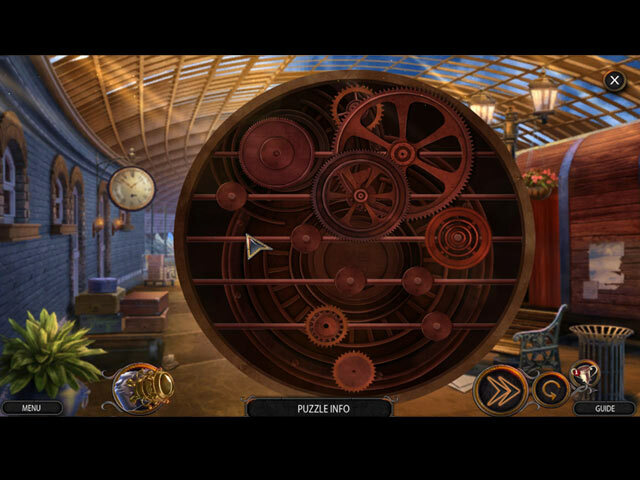 There is also a scene in which you must search for two parts of a symbol, which, when combined, create a symbol which you must remove PUZZLES: There are thirty-one (31) puzzles in the game. Most of the puzzles are easy, some ridiculously easy. To me, entering a combination for a lock is not a puzzle. However, there are some maze puzzles and connection puzzles which I found somewhat difficult. The instructions are well written. Although most are easy, most are creatively designed and thematic. SPOILERS: HERE ARE SAMPLES OF PUZZLES AFTER THE DEMO: A. Matching puzzle. Match up related symbols on rocks. B. Sliding bars puzzle. Slide bars up-and-down and sideways to move them to create a path so that a piece of a lock can move from the left to the right of a lock assembly. C. Connection puzzle. Remove colored lights by connecting them so that all are matched up and none remain. 3X Increases in difficulty. D. Connection puzzle. Move a sandbag from one crane to another using arrows to move the cranes and a button which drops the bag onto the cranes. Move the bag from crane-to-crane until you reach the X where you must drop the bag into its final position. E. Maze puzzle. Using a pallet jack, move five barrels to a spot when they will drop to the ground below. BONUS CHAPTER: F. Connection puzzle. Rotate 25 squares in a grid to connect links to create one smooth line. G. Sequence puzzle. Move dials which maneuver liquids in three test tubes so that the amount of liquid matches up with the numbers at the top. Rated 4 out of 5 by campingramps from Finally, a game worth playing Big Fish must be listening because they are finally bringing out games worth playing. This one has just the right amount of interesting play along with a pretty good story and believable characters. Graphics are nice and colorful with a little darkness to make it interesting. HOs and mini games are on the easy side but not ridiculously so. I thoroughly enjoyed this one and it will be added to my collection. I highly recommend this game. Rated 4 out of 5 by Yurnmesis from Trial: Solid Graphics! Impressed! Interesting Story! So nice to finally give a strong plus review. From the beginning, this story pulled me in and took me on an interesting journey…where will it take me? Don’t know, but I’m buying this one! Graphics were created with attention to details. Characters were nicely done. Locales and scenes were filled with details and great décor. Even the first Hidden Object story book game was done well with only two items to locate, mostly easy to spot but some well-hidden, the second one not so great. 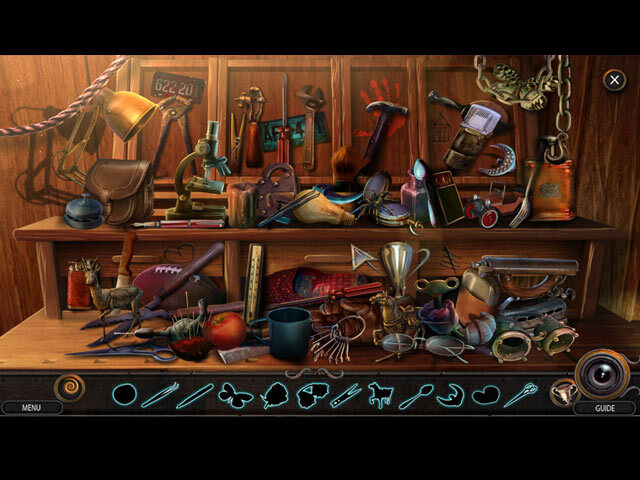 Original style Hidden Object Games offered beautifully crafted designs, some interaction and some too well-hidden items. Inventory items made sense. Mini Games were interesting and varied in design and difficulty, not a fan I skip them but at least I gave these a ballpark try. Big Plus! This game wasn’t focused on numerous game fillers because it moved forward without constant interruptions. The story flowed, the dialogues/scripts were skillful and the voice overs were excellent. I even enjoyed the music and sounds. I am going to give this a 4 based on my trial experience. I hope I can change that to a 5 after playing the full game and hope my continued experience will impress and not disappoint. Rated 4 out of 5 by dancemom1 from Am I dead or dreaming? Hello friends! As usual, I review mostly on the game play and leave the story line to those who do a much better job than I. We have #2 in this series. The graphics are excellent, very clear and no noticeable blur, for a change. Colors are very nice, with very little blue , as in the first game of this series. Game play was excellent, with no glitches or problems during the demo. This dev does an excellent job on animation. The movements are very fluid and realistic. Voices were age and character appropriate, and were well done, as far as the "bad guy" was concerned. Our heroine's voice was very familiar and quite annoying. It was too high pitched for me, but fortunately not constant. We can click through dialog if we read faster than they speak. I didn't really hear any music during game play. We did have some nice sound FX, but otherwise, the game was fairly quiet, except for the "ching" noise we got when we found an item. We did not have a helper as such, but we did have a camera that points out paranormal objects. That seems to give us a hint as to where to go or what to do next. HOPs are varied and very well done, with interactive lists, silhouettes and finding pairs. The scenes are very clean and items were not difficult to find. We also have a morphing object to find. I did not see that we could switch to anything else. Puzzles were pretty simple and took no time to complete. I only ran across one that had a little challenge to it. HOPs are few and far between, as are puzzles, but close enough to break the monotony. Hint system is helpful, but it does not transport to longer locations. We do a lot of back tracking, but it is a fairly close run, so no real long distance. We have a jump map, but it is very bland and boring. Again, we have the pop out type of map. Just give me a map with a picture of the location, the name and whether I need to go there or not. Obviously not my favorite set up for a map. Collectibles were are well done. We have the usual symbol for this developer, which is quite large and easy to find. We also have morphing items within each scene. These items morph pretty quickly, so be on the look out for them. Also found collectible cards that show picture of the characters. These are not in every scene and can easily be overlooked. We have another interesting story in this series. It is easy to follow and flows quite well. We have a lot to do, so we don't really get bored or tired of running around. One thing I do like, when setting up my game play, I can lower the skip time to only one second. I really like this feature. Anything more than 10 seconds is a waste of time for me. There isn't really a lot of challenge to this game, but I do like the story, and all the collectibles, and find the need to play it out and see what happens. The demo ended perfectly, a well done cliffhanger, making me definitely decide to purchase the game. I think most all levels of players will find this one enjoyable for one reason or another. I gave this one a 4.25. As always, try it for yourself and see what you think. We all have different tastes in games and you may not care for this one at all. Thanks for the reviews. Play on! Rated 4 out of 5 by pgillenw from WowI Enjoyed This Game! I had been waiting for a great new game to come along and this game did not disappoint, To all game lovers I wish you a good day as you give this game a play.